This paper utilizes oncology as the thematic core of an interdisciplinary narrative describing spatial tensions between capitalism and developments in the countervailing social and solidarity economy (SSE). This exercise explores oncology as metaphor, as a methodological model, and for intervention and policy change. A Marxian framework supports this narrative construction. Vampires, the fundamental class process, and the circuit of money capital are concepts that link the genetics of cancer and recent advances in oncology research to political economy. The application of geographic information system (GIS) technology contributes a spatial dimension to this story. Maps and exploratory spatial data analysis of the metamorphoses generated across the stages of the circuit of money capital present GIS’s capacity to replicate the genetic mapping of cancer mutations used in oncology. In addition to diagnostics, genetic mapping enables targeted patient-specific hormonal treatments. Similarly, it is argued that the SSE is an effective locational treatment strategy for the adverse effects of capitalism’s metabolic processes. Copyright: American Review of Political Economy; Benjamin Wilson, 2018. Heterodox economics is a pluralist academic project grounded by a rich theoretical tradition that draws upon the institutionalist evolutionary framework of Thorsten Veblen (Veblen, 1898), the historical construction of the double movement by Karl Polanyi (Polanyi, 1944/2001), Karl Marx’s historical materialism (Marx, Moore, Aveling, & Engels, 1867/2011), and Henri Lefebvre’s The Production of Space (Lefebvre & Nicholson-Smith, 1974/1991), to name but a view. In contrast, orthodox economics grounded by methodological individualism is a simple but mathematically elegant story that lacks the depth, humanism, and historical context found in the former. A potential factor in the staying power of orthodox thinking in the field today, despite the shallow nature of its presentation, was its marriage to what was the cutting-edge science of its day. Newtonian physics delivered a framework for animating the prize fighters of capitalism’s story by transforming it into neoclassical economics (Henry, 1990). Mathematical modeling offered the abstract presentation of Say, Senior, and Scrope credibility as hard science and helped capture the public imagination by moving their classical narrative of hard work and thrift into the Cartesian plane. Today, a similar opportunity is available for heterodox economics. The limitations of the orthodoxy’s reductionist ontological foundation are rendering structural models useless, as evidenced by many applied micro practitioners moving towards the a theoretical modeling of big data. 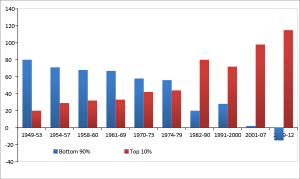 Raj Chetty’s groundbreaking work in inequality is an example. In contrast, paradigm shifts grounded by a reflexive ontology in disciplines such as ecology, microbiology, psychology, and oncology are embracing and advancing new holistic epistemologies in their fields. These advances afford the diverse theoretical history of heterodox economics a variety of tools from which compelling interdisciplinary narratives can be constructed. As an example, this paper employs the historical, theoretical, and methodological evolution of oncology as a contextual background for advancing a Marxian analysis of modern finance capitalism and the countervailing emergence of the social and solidarity economy (SSE). This process introduces two principal advantages to the heterodox economist. First, applying oncology promotes the accessibility of this complex subject matter beyond academia and into the public domain. Second, from the investigation of individual cells, to path-breaking discoveries in the human genome, cancer complements the Marxian framework on several levels. Metaphor, as a fundamental literary device for the development of a compelling narrative, is the first of these levels to be explored. Marx understood the importance of communicating to the general public, and his poetic use of both vampires and werewolves armed political economy with one of the most descriptive, vivid and discussed metaphors for capital across the humanities and social sciences to date (Neocleous, 2003). As a metaphor, cancer adds to the visualization of these monsters’ violent destruction during industrial capitalism, a slow-moving death that not only captures the imagination, but relates to people on an experiential level. For anyone who has had cancer or shared the suffering that it creates for friends and loved ones, a deep and thorough understanding of the disease is unavoidable. Thus, cancer and its lexicon contribute common ground for generating conversations and communicating the exploitation of the earth and human beings in the capitalist system in classrooms, coffee shops, and living rooms. In addition to contributing a meaningful metaphor, oncology’s application of the Human Genome Project and the subsequent Cancer Atlas supply this interdisciplinary narrative with a methodological approach. The mapping of genetic mutations over the healthy genome is allowing oncologists to identify the origin of cancer’s growth and to introduce hormonal treatments for a wide variety of cancers (Tomasetti & Vogelstein, 2017). For heterodox economists, a similar process of spatially overlaying attribute data for comparative analysis is possible in geographic information system (GIS) software. Maps and visualizing data in its spatial context is a powerful means of identifying patterns, sharing data with the community, and identifying sources of resistance to exploitation. Hence the final level on which oncology and a Marxian examination of capitalism complement one another is in a comparison of treatment and policy. Hormonal treatments are made possible through the mapping of genetic patterns. These treatments are targeted and often eliminate many of the painful side-effects commonly experienced during and after the traditional cancer treatment regimens of chemotherapy, radiation, or surgery. As an analog, the emergence of SSE activities represents an antidote to many of the external costs generated by capital’s exploitation of people and nature. SSE development is a countervailing force that enhances the metabolic relationship between and across people and planet. To explore this in greater detail, the final section uses spatial visualization of attribute data in the food system. These images are the first stage in exploratory spatial data analysis. While further analytics are possible, maps in and of themselves are effective tools to promote communication at the grassroots level. This communication is necessary to design policies that ameliorate socio-economic struggles by stabilizing and growing SSE activity. While cancer is an emotional subject, the appropriateness of oncology as an interdisciplinary complement to the analysis of capitalism is not simply a sensationalist exercise; it is supported by theoretical, historical, and methodological parallels. The theoretical and historical relationships between capital and cancer are explored first. Here a meaningful common metaphoric language is developed. Central to this presentation is a critique of orthodox economics’ modeling of the rational agent. Building upon an individual level interpretation of the disease, oncology’s war is examined from an historical perspective and juxtaposed with the policy actions guided by the agenda of orthodox economics. In the following section, the imaging technology of GIS is displayed. Through the adoption of GIS, Marx’s circuit of money capital is qualitatively, quantitatively, and spatially examined in a comparative analysis of the industrial and alternative food systems. The final section discusses applying spatial analysis to advance both the methodology of heterodox economics and policy development tailored to local social and solidarity efforts to achieve sustainable health and prosperity. Similar to Dr. Mukherjee, millions of humans across the planet are dealing with this illness on a personal level that is re-writing their own biographies. Beyond the personal nature of the experiences described in Maladies, the theme of individualism is ever present. It is important to note in the above quotation that cancer is a “deranged image in a mirror.” Cancer is in fact inside of us all, as “a cancer cell is an astonishing perversion of the normal cell” (Mukherjee, 2010, p. 38). Consequently, oncology, in its efforts to cure this disease, wrestles with a central issue in heterodox economics. Is the perversion of the cell internal, suppuration of blood (an early individualist explanation of cancer) or are there external forces, carcinogens, to be identified as its cause? This debate extends research in oncology beyond the confines of reductionism and into more holistic examinations. Following the reflexive approach of oncology in political economy requires examination outside of orthodox economics’ reliance on the individual as the primary unit of analysis. Toward this objective, Marx’s historical materialism affords both context and a relevant unit of analysis. Let us begin by suggesting that the origin of cancer is found in Marx’s capital; that is, cancer emerges and grows from the exploitative social relation. In the modern epoch of capitalism, capital is the relationship between the owners of the means of production, including money capital, and those that must toil and trouble for the wages necessary to produce and reproduce their daily lives. In other words, the economic building block is the social relation, just as cellular relations aggregate to create all organic life. The exploitative individualist interpretation of the war of all against all is taking place internally in Rudolf Virchow’s omnis cellula e cellula (“all cells come from cells”) (Virchow, 1858/1860/1972). The rational agent, the self-interested individual, is our “deranged” self, and the fundamental class process stimulates the metamorphosis of human interactions into a variety of diseases. The free market illusion presented by orthodox economics celebrates a cancerous interpretation of humanity as the answer to the problem of resource allocation. While in contrast, the altruistic and cooperative individual is our best self and a healthy social relation. I will dedicate more on this in the sections to follow, but for the time being, focus remains at the individual level to examine the parallels between the cancer cell’s mutation and growth and the orthodox model of economics. However, before proceeding, one brief caveat, as some may be asking: cancer is much older than capitalism, is it not? So how can cancer be limited to capital as a fundamental class process (FCP)? The dynamics of the FCP and the prevalence of cancer in societies appear to follow a similar evolutionary pattern. During the previous century, cancer has had its best years by measures of growth and diversification. This is in part due to better medical technology, the identification and proper diagnosis of the many variants of the disease, and from increases in human life expectancy (Mukherjee, 2010). Cancer is a process, a slow-moving death from within. But the growth of cancer’s reach is also strongly associated with social and environmental factors, such as smoking, pesticide and fertilizer use in agriculture, a number of viruses, industrial solvents, and metal compounds (National Toxicology Program, 2016). Thus, much like capitalism’s mantra, for cancer, growth is good, and the globalization of capital is fueling a worldwide expansion of the disease, where “over 14 million cases of cancer occur each year, and this figure is expected to reach 22 million by 2030” (National Toxicology Program, 2016, p.1). Simply put, growth is cancer’s objective. Mutated cells multiply and overrun the healthy cells in the human body. There are a number of words used to describe cancer’s growth and this cellular behavior. One of the most familiar is metastasis. Cancer metastasizes and becomes nearly impossible to stop. This process is common in breast cancer. When cancer metastasizes, it often returns in an aggressive, treatment-resistant form. Think financialization. The financialization of mortgages was aggressive and resistant to all forms of regulation or treatment. Returning after decades of successful suppression following the Great Depression, financialization burst out of remission, metastasized globally, and its growth could not be contained. The systematic expansion in the number of derivative contracts could be referred to as neoplasia, the rapid reproduction of cells (Mukherjee, 2010). This malignant neoplastic explosion of social relations, in the form of money contracts, generated abnormal growth in the form of the housing bubble. Only through radical treatments, applied by the monetary and fiscal authorities, was the patient able to survive its explosion. Much like a cancer patient, our economy remains weak and unable to return to the level of strength and vitality it once possessed. Instability and sluggishness remain, after blunt and painful treatments with adverse side effects, such as foreclosures, layoffs, quantitative easing, and the incisions of austerity. In Marx’s monstrous terminology, financialization: “in its blind unrestrainable passion, its werewolf hunger for surplus value… usurps the time for growth, development, and healthy maintenance of the body. It steals the time required for the consumption of fresh air and sunlight” (Marx et al., 1867/2011, p. 291), thus making true recovery all but impossible. But, unlike the monster’s overt violence, this process was slow and grew underneath the radar of regulatory diagnosis. An instructive tool for analyzing the growth of financialization’s toxic disease is Marx’s circuit of money capital, the genetic code of capitalism. Despite modern interpretations of Marx provided by John Bellamy Foster (2009) and Paul Burkett (2014), an under-examined component of Marx’s presentation is the metamorphosis that occurs across the stages of the circuit and the resulting changes to the system’s metabolism. These biological metaphors connect humans to the environment and complement modern advances in medicine that differentiate between environmentally and genetically driven physical transformations. 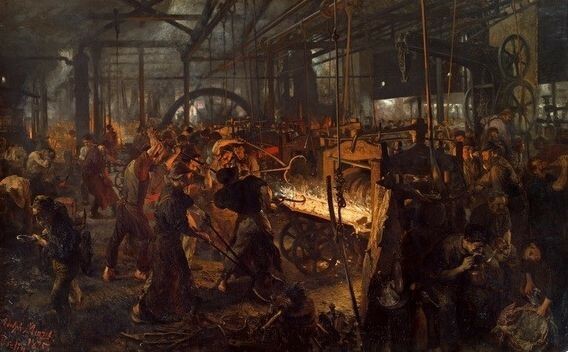 Under the industrial capitalism of Marx’s time, metamorphosis was the dramatic scene in the factory and inspired the vampire and artistic expressions of the violence wielded in the production process (see Figure 1). In this space, every ounce of human vitality is being drained by the vampire: “Dante would have found the worst horrors of his inferno surpassed” (Marx et al., 1867/2011, p. 272). During living labor’s metamorphosis, the exploitative nature of the social relation is explicit, and it is not difficult to explain the weakening of the circuit’s ability to reproduce itself as the vitality of the worker and the circuit’s metabolism are consumed by capital. While time remains, “the vampire will not lose its hold on [the worker], ‘so long as there is a muscle, a nerve, a drop of blood to be exploited’” (Marx et al., 1867/2011, p. 330). These destructive metabolic transformations demanded treatment in the form of revolutionary legislation. Without the passage of laws reducing the working day or mandating for the safety of children, unregulated capital may not have survived its demand for surplus value and killed its host. These victories for labor came from an alternative social formation. The coordination and organizations of labor in the form of unions fostered an antibody response to the disease’s progression in the forms of mutual aid and solidarity. Much like the body reacts to support life, social systems are also able to reject and fight against disease and violence. However, similar to cancer’s ability to mutate and resist treatments, capital is also adaptive. In this modern epoch, exploitation and alienation are masked by paperwork, business casual clothing, and the presentation of a different life in social media. Thus, despite the reforms of the early 20th century and later efforts such as the New Deal, the weakening of our economy’s metabolism continues today. The exploitation of human energy and natural resources is taking place on a global scale. One process used by capital to ensure the annihilation of time and space is the financialization of value chains across industries such as food (McMichael, 2013). Financialization creates distance between the stages of the circuit of money capital as purchase, production, and sale are pushed further away, because the activities of financial institutions and investors are often taking place virtually in financial centers concentrated in the world’s wealthiest countries, often well before commodities are grown or delivered, and often at great physical and cultural distance from the point of production (Clapp, 2014, p. 5). For example, the securitization of home mortgages distanced the homeowner from the final financial products traded as mortgage backed securities and changed the social relation between borrower and lender. Distance facilitates exploitation and fraud and allows transactions to expand into millions of anonymous electronic transactions, increasing the difficulty of diagnosing them as malignant (Wilson, 2015). No longer are the fangs of capital in the open. They now take their bite out of the economy under the cover of financial innovation. Creating space and distance from the origin of financial decisions is similar to the evolution of cancer in our bodies. Cancer is treated, and the disease goes into remission. A woman has a bilateral mastectomy and receives some chemotherapy. This combination removes any signs of the disease. However, several years later, she experiences some back pain and fatigue. Because the cell mutations have moved to new locations (metastasized), the doctor prescribes some pain medication and physical therapy. Cancer is very skilled at deception. Meanwhile, the disease continues to spread, penetrating her bones, multiplying in her lungs, and spreading to the brain. By the time the crisis is realized, only a “hero” surgery is possible, and even then, life afterwards would be so intolerable and short that the best course of action is palliative care. Similarly, following the most recent wave of deranged cellular mutation, current political discourse directed by the conventional wisdom of orthodox economics, is promoting palliative care. People are pacified by cappuccinos (Zukan, 1995) and in some sectors morphine drips are comforting the patient, but at the end of the day, our economy and society is marching towards a violent and painful demise, because current policy can only forestall “the vampire thirst for the living blood of labor” (Marx et al., 1867/2011, p. 282). Regardless of policy, shorter working days, the New Deal, or the Affordable Care Act, capital’s deranged self returns, just as cancer is almost certain to return if the patient lives long enough. The financial crisis was the most recent metastatic event, leaving millions without their homes and jobs, decimating cities, and leaving visible scar tissue across urban and rural landscapes. 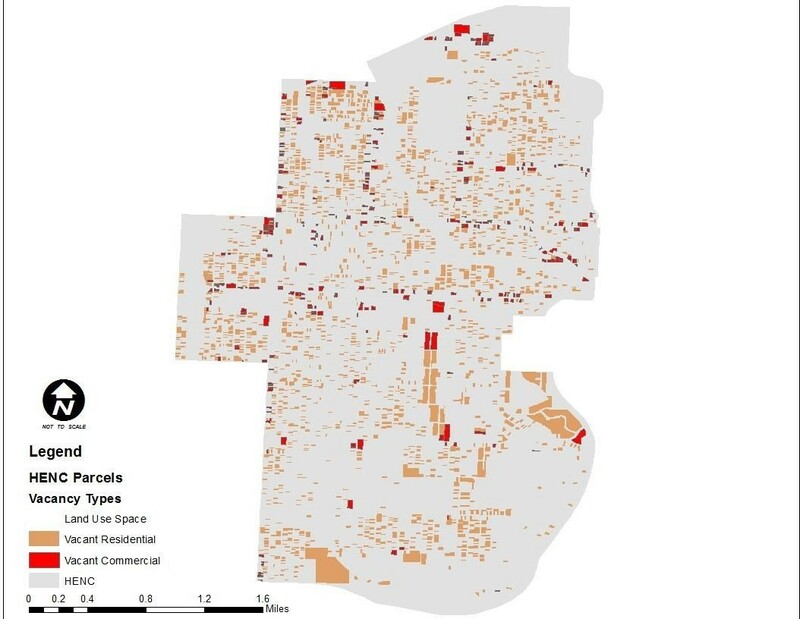 These scars can be visualized in the GIS in maps of vacancies (see Map 1), chronic disease (see Map 2), food deserts (see Map 3), and life expectancy (see Map 4). So how do we approach this problem? Cancer research began by treating the disease at a macro level through radical surgery and chemotherapy. Very little was known about its cause and evolution until late in the 20th century. This is, in many ways, similar to economics. The neoclassical school assumes a universal rational agent. Little can be done at the micro level, as we are all fundamentally homo economicus. Moreover, macro policy, the strong fiscal arm of the Keynesian era and the Laissez-Faire new monetary consensus of neoliberalism are top down policy schools designed to control the symptoms of disease. Consequently, capitalism’s fundamental symptoms remain, “its failure to provide full employment and its arbitrary and inequitable distribution of wealth and incomes” (Keynes, 1991, p. 372). These top down strategies share some resemblance to the war on cancer. The war on cancer continues to collect countless victims and spread grotesque violence inside and between human beings. As an example, the earliest efforts to remove breast cancer involved “using fire, acid and leather bindings” (Mukherjee, 2010, p. 301). While leather bindings are no longer standard, the war on cancer’s offensive has implemented scorched earth approaches to surgery and chemotherapy. However, despite the fervor behind oncologists’ quest to cure cancer, the field has remained capable of overcoming deep vested interests, both monetarily and in research, undergoing significant paradigm shifts through the decades. These shifts in treatment and philosophy are often inspired by discoveries of the past that were passed over by the march of progress. By the 1990s, “The quest to combat cancer turned inward, toward basic biology, toward fundamental mechanisms…We must, at last, return to the cancer cell” (Mukherjee, 2010, p. 333). In economics we too must look inward, re-evaluate our interpretation of the individual, and revive our most important and ignored subject: value (McMurtry, 2013). Much like cell division’s role in the health and wellbeing of organisms, society’s health is contingent upon an equally important process, the division of labor. Under capitalism, the division of labor is functionally driven by the need to accumulate surplus value in the form of money capital. This genetic coding, or DNA, for the division of labor under capitalism is pathological. Similarly, cancer develops when normal cells undergo genetic mutations. These mutations either drive cancer cell reproduction, oncogenes, or inhibit tumor suppressors hampering the body’s ability to fight off cancer cell growth (Vogelstein & Kinzler, 2004). All the pathways of normal cell division have been mapped in the Human Genome Project. The task of oncologists is now to map the pathological expansion of mutated genes in the Cancer Atlas Project. By overlaying the mutated patterns over the normal genetic code, oncologists can identify where specific cancers emerge and develop targeted patient-centered treatment strategies. Unfortunately, the task for heterodox economics is not as clearly defined. Two reasons materialize to describe this lack of clarity. One, what is a normal economy or genome? Second, economics remains confined to a narrow field of primitive treatments. Economics rests in the era of radical surgery and the equally radical carpet-bombing approach to chemotherapy. Macroeconomic treatments are sold to patients in the form of policies such as quantitative easing and massive cuts to socially and environmentally driven programming in the name of austerity. The latter of these two fundamental problems is addressed to clarify the path forward, with an analysis of what may represent a normal or healthy FCP to follow. The healthy division of labor is discussed within the context of the SSE. In the SSE, production is driven by a fundamentally different DNA that extends value generation beyond the narrow pursuit of money profits. Pathways in both the division of cells and in labor are core processes for disease progression that inflict pain and death on patients and societies alike. For oncologists battling cancer in the early 20th century, the pathway of cancer’s growth was dominated by a theory of centrifugal force. Cancer starts in the breast, and if it is all removed from the body, the patient is cured. However, if surgery does not remove all of the cancer, then it will continue to spread in the body. This theory was applied as an explanation for why so many women who received mastectomies were suffering from recurrences of the disease. A principal advocate of this theory was Dr. William Halstead of Johns Hopkins University. Halstead was a surgeon. As a surgeon, he enhanced and furthered the practice of radical surgery (Sakorafas, 2008), a procedure in which more and more tissue is removed from the body to ensure that all the cancer has been removed. This approach to treating breast cancer dominated the field. 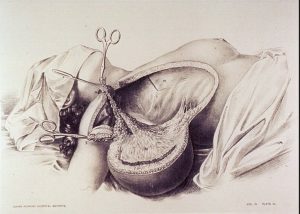 Many women were subjected to these transformative dismembering surgeries (see Figure 2). Halstead and his later descendants performed increasingly radical procedures on their patients. As late as the 1960s, the radical mastectomy had evolved into the “super radical” and then the “ultra-radical” (Mukherjee, 2010, p. 194). This procedure was the preferred method of managing the disease, as “radical mastectomy was used to treat 47.9% of patients in 1972” (Sakorafas, 2008, p. 605). In this disfiguring procedure, the “breast, the pectoral muscles, the axillary notes, the chest wall, and occasionally the ribs, parts of the sternum, the clavicle and the lymph nodes inside the chest” are all surgically cut away from the patient (Mukherjee, 2010, p. 194). This method of treating breast cancer was unfortunately misguided, by the general acceptance of the theory of centrifugal force. This force is not how cancer spreads through the body. Thus, thousands of women underwent a violent surgery and transformation of their bodies, as surgeons built successful careers and bolstered the prevailing conventional wisdom. Ironically, from a political economy perspective, the discovery of the stages of cancer and the potential for much less invasive surgeries to be equally or even more successful in putting cancer in remission would come from a British physician by the name of Keynes. His findings were first published in his 1954 piece, “Carcinoma of the Breast: The Unorthodox View” (Hellman, 1994). In challenging the status quo, Sir Geoffrey Keynes applied a mixture of treatments. Radiation directly to the tumor and small surgical procedures to remove tumors were conducted with mixed results. Some of Keynes’s patients remained in remission and cancer free. In reporting these results, American surgeons dismissed Keynes and assigned the pejorative label of lumpectomy to Keynes’s procedure (Mukherjee, 2010). While the “mainstream” in breast cancer treatment was dismissing this work, others were working to understand the failings in the centrifugal theory. What is the true path of cancer’s development? This question was being approached from a different perspective in chemotherapy. However, similar to the assault on the female form taking place in breast cancer treatment, doctors’ application of chemotherapy was equally radical in the 1970s VAMP era of cytotoxic drug cocktails (Mukherjee, 2010). In fact, the war agent, mustard gas, was one poison tested to potentially kill deranged cancer cells (Krumbhaar & Krumbhaar, 1919). Like many advances in science, the observation that mustard gas kills cells in blood and bone marrow was unrelated to leukemia research and essentially an accidental discovery. Nevertheless, this discovery ushered in a cascade of attempts to find various combinations and levels of poison capable of eradicating the body of cancer, while not killing the patient in the process. To the casual observer, it would appear prudent for the chemotherapist to consider the similarities between launching a chemical war on cancer to the preceding battles undertaken by force of the knife and scalpel by their radical surgery colleagues. But in similar fashion to the dismissal of Keynesian economics in the 1970s by the more “scientific” approaches to macroeconomics developed by the monetarists, chemotherapy, like monetary policy, was considered by its practitioners to be more technically sophisticated and immune to the critiques of their predecessors. In their defense of the New Classical School in economics, Robert Lucas and Thomas Sargent claimed that their approach to economics is as “free of ideological difficulties as, say, chemistry or physics [and] promise[s] a straightforward expansion of economic possibilities” (Lucas & Sargent, 1981, p. 295). This economic consensus advocated for minimal fiscal interference or surgeries, and to rely on a steady dose of predictable monetary tools to provide stability. Additionally, by claiming to be ideologically free, orthodox economics surrendered value determination and broader political discussion to market forces. Only in times of crisis are deviations from the protocol necessary. Unfortunately, for many of the patients, their doctors, and the global economy, neither of these “scientific” approaches to treatment would stand the test of time and would result in gross under-valuations of health, education and other public goods. As it stands today, the debates in macroeconomics and the corresponding political discussions remain mired in a mode of palliative care. The Great Recession provoked a brief period of stimulus and unprecedented monetary policy, but fiscal stimulus was temporary and was followed by a wave of international austerity. Cuts to vital social programs that promote life-sustaining human and social metamorphoses, as well as unprecedented efforts to remove toxic assets from the balance sheets of the world’s financial institutions represented radical treatment policies. Quantitative easing possesses a striking resemblance to a radical procedure in chemotherapy to treat leukemia called autologous bone marrow transplant (ABMT). In this extraordinary treatment regimen, the bone marrow of the patient is “obliterated” by cytotoxic drugs and replaced by “clean marrow from another patient” (Mukherjee, 2010, p. 309). In the case of monetary policy, the toxic assets that proliferated and poisoned the bloodstream of the global economy were extracted. The Fed purchased these assets from banks and replaced the balance sheet void with dollars. The chart in Figure 3 from the Cleveland Federal Reserve Bank displays the dramatic expansion of the Fed’s balance sheet during this radical policy procedure. The transplant of dollars into the financial system, representing a blood transfusion, has done little to make the economy healthier in a meaningful way. Just as the recovery from ABMT is fraught with complications and life-threatening dangers that might not always be expected, the unexpected result in the aftermath of the QE treatment regimen was the emergence of a “jobless recovery” and a “great stagnation,” leading many to ask whether this is a recovery at all (Palley, 2012). In contrast to this dogmatic, even religious, commitment to standardized monetary and fiscal policy taking place in economics, the field of oncology transitioned into new territory to find more precise, effective, and lasting treatment options for patients. This terrain for advancing cancer research is found in the Human Genome Project and the subsequent Cancer Genome Atlas (Mukherjee, 2010). Fertile ground for interdisciplinary studies, genetic mapping is producing new knowledge of core processes of both the healthy normal cell and its deranged image in the mirror. Observed patterns are exposing the mutations of genetic code and their causal mechanisms for several cancers including brain, lung, pancreatic, and ovarian cancer (Vogelstein & Kinzler, 2004; Tomasetti & Vogelstein, 2017). This paradigm shift in oncology is a “revolution in cancer research that can be summed up in a single sentence: cancer is, in essence, a genetic disease” (Vogelstein & Kinzler, 2004, p. 789). On the surface, it may appear that identifying cancer as a genetic disease would suggest a reductionist approach to understanding its progression. However, “it is best to think of mutated cancer genes as contributing to, rather than causing, cancer” (Vogelstein & Kinzler, 2004). Rather than being a disease rooted in the individual’s biology, cancer “resides at the interface between society and science, challenging our population to confront its customs and behaviors” (Burstein, 2000, p. 1). Behaviors presenting the greatest challenge are rooted in the rigidity of ideas and the corresponding value system, or lack thereof, promoted by neoliberalism. Maps of the destructive pathways originating in the space between our genetics and life environments are found in the biological mutations responsible for tumorigenesis (Tomasetti & Vogelstein, 2017). These alterations’ technical names are oncogenes, tumor suppressor genes, and stability genes. Oncologists often use the automobile as a metaphor to describe these genes’ malfunction when they mutate. An oncogene mutation is a broken accelerator; the tumor suppressor is a broken brake system, and the stability gene “is akin to an inept mechanic” (Vogelstein & Kinzler, 2004, p. 790). Rather than continuing with the automobile metaphor, these three mutations are present in the prevailing capitalist social structure as: a failing monetary authority and its inability to control the explosive expansion of harmful speculative money contracts; a fiscal system slashing and cutting social systems through austerity in conjunction with an ever repressive police and military state; and a financial industry that benefits from the generation of economic instability—as exemplified by the then Republican Presidential candidate explaining why he “sort of hoped” the housing market would tank in 2006, because his cash position would allow for speculative purchases and future earnings (Diamond, 2016, p. 1). The fundamental class process under capitalism is the genetic source of these three societal mutations. Infection and disease follow as financialized circuits of money capital extend spatial and social distance between the true sources of value, labor, and soil. Deregulating the financial industry put the oncogene into overdrive. Financial neoplasia “was estimated at $600 trillion… [a] figure that amounts to about $100,000 in derivative bets for every man, woman, and child on the planet” (Stout, 2009, p. 31). The outrageousness of this likely contributes to McMurtry’s (2013) claims of a complete disconnection between the financial transactions, or what he calls the transnational money sequence, and any real value generating form. However, the links to real human goods and assets remains real and explains why the subsequent debt deflations extracted wealth from so many millions of people across the planet. QE as the primary treatment for the expansion of toxic assets is not likely to be an effective cure. Lurking somewhere under the jobless recovery’s surface is yet another cancerous bubble ready to consume healthy cells across the system. Like an inept mechanic, the financial industry is not a mechanism facilitating healthy growth in the economy, but is a genetic mutation that promotes dangerous speculative behavior and undermines stability. While a strong fiscal arm could be used to positively counter the adverse redistribution of society’s assets, austerity and expansion of a police state both at home and abroad obstruct society’s immune system’s ability to promote healthy social and environmental change. In fact, the redistribution of wealth under the neoliberal paradigm is occurring in the opposite direction (see Figure 4). To meet this challenge, new technology and diagnostics are needed. Returning to our earlier quandary for economics, what is a normal economy or social relation? In the heterodox economics literature, SSE institutions are “emerging as life affirming solutions to the global crisis through the multiple ways people locally reinvent economic life on the margins of the capitalist system based on values of solidarity, reciprocity and sustainability” (Dash, 2016, p. 61). This peripheral relation to capital has led some to characterize them as exilic spaces (Grubacic & O’Hearn, 2016) that exist and reproduce themselves despite pressure to conform or mutate. One concern that this interpretation raises is if this core periphery relation exists, then healthy social relations are an abnormality in the global corpus, thus indicating an extraordinarily deep progression of the disease. While this is an ominous observation, one of the amazing outcomes witnessed in people’s fight against cancer is the tremendous heroism, love, strength, and compassion that emerge among the patient, their family and friends, and the medical teams treating them. Similar reactions are taking place in neighborhoods and communities across the globe. In times of extreme adversity, solidarity surfaces and affirms the validity of observations that, “those… who acquire habits of mutual aid are undoubtedly the fittest [and] have more chances to survive, and they attain… the highest development of intelligence and bodily organization” (Kropotkin, 2014, p. 12). This is the body’s rejection of the disease. French sociologist Henri Lefebvre (Lefebvre & Nicholson-Smith, 1991) called this immune response autogestion, a flat refusal to accept the material provisioning of the system. This process also calls to mind Karl Polonyi’s double movement (Polanyi, 1944/2001). A contemporary illustration of this healthy response to capital’s exploitation and destruction of social and environmental space is the emergence of alternative farming. These pathways of healing provide opportunities to examine and compare the results of healthy social relations and the institutional structures that support them to the deranged dynamics of capital. As indicated by McMurtry (2013), the money sequence is critical. The circuit of money capital’s spatial distribution can be mapped, and the metabolic transformation across the circuit can be examined to understand the genetic mutations of societies DNA. Geographic information systems (GIS) provide social science with a tool to identify value and life generating goods and services that produce healthy metabolic change. The proposal here is to use GIS to build a societal genome project to identify effective SSE activity. For instance, comparison of the metamorphoses occurring between the points of production in the industrial food system and locally organized sustainable agriculture, identify very different pathways in the division of labor and the interpretation of surplus value (Wilson, 2015). Additionally, GIS delivers the imaging necessary for targeted treatment. How do the core fundamentals of the social process reproduce themselves? Identification of mutual aid and solidarity represents a hormonal approach to treatment. This is a different pathway for cell division. It is not necessary for significant parts of society to be destabilized and weakened before we can bring them back to health. Just as technology propelled cancer research into genetic mapping, innovative social science that applies GIS as a diagnostic tool is capable of rejecting the “genetic essence of the tribe of homines economici” (Dash, 2016, p. 69). GIS equips scientists of all disciplines with a tool to analyze the scars, open wounds, and infections left by capitalism’s malignant diseases. Racism, fraud, alienation, and exploitation can all be displayed vividly across landscapes at a multitude of spatial levels and aggregations. 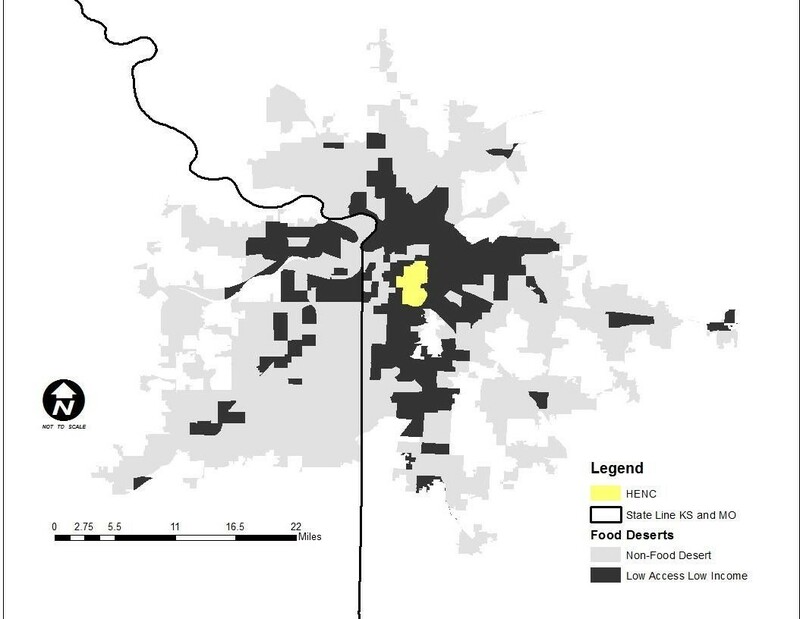 For example, the basic mapping of urban versus rural spaces at a wide scale (see Map 5) helps to identify the urban migration patterns and the disinvestment occurring in our rural communities. The initial purchase phase of the circuit has transitioned from a decision made by the farmer to a corporate decision as a result of capital’s concentration of farm ownership in the 20th century. The number of U.S. farms fell by more than 60 percent while average farm size increased by 67 percent (Freedgood & Fydenkevez, 2017) concentrating both ownership and creating distance between the purchase and production stages of the circuit. 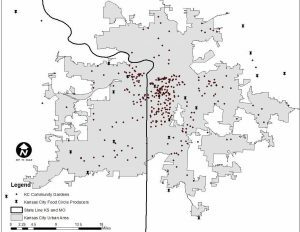 More focused analysis zooms in on the distribution of food deserts and food allergies across Kansas City, Missouri’s urban area and exposes the sale stage of the circuit (see Maps 3 and 5). A change of lens identifies the biological metamorphosis generated in the production stage by inorganic nitrogen (see Map 6). Further economic imbalances are evidenced by the scars of vacancy (see Map 1) in the same geographic spaces as food deserts and concentrations of chronic disease. Each of these maps provides an alternative scale and perspective of various environmental and social issues as they relate to the purchase, production, and sale of industrial food. This analysis helps to visualize the distance generated by financialization of value chains. 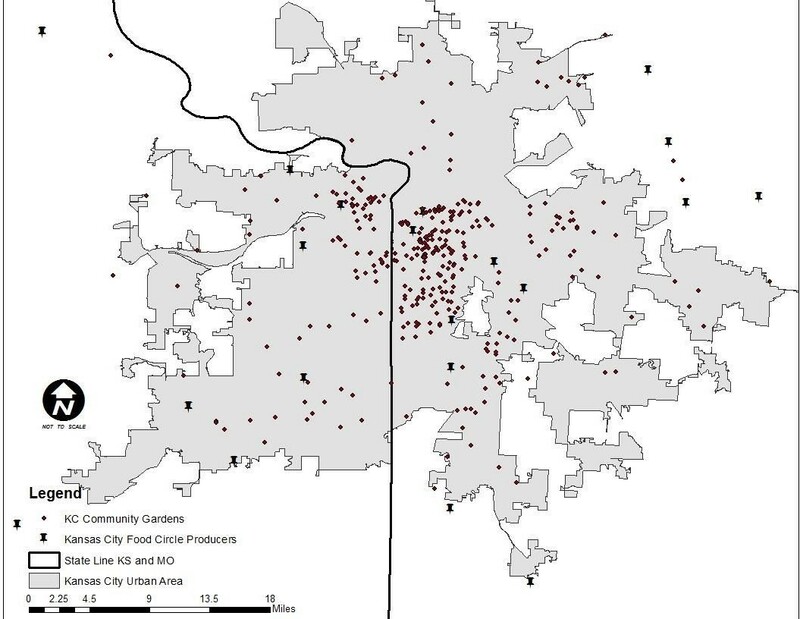 Urban spaces are formations of capital and are the source of urban predatory practices fueled by debt contracts (Harvey, 2012). Such debt relations originate value chain agriculture with the purchase (M – C) stage of the circuit (McMichael, 2013; Wilson, 2015). After the circuit’s sequence, sale often returns to the urban spaces. The distribution of food in the food system is problematic as the prevalence of food deserts and food insecurity is a persistent social problem (Ver Ploeg et al., 2012). 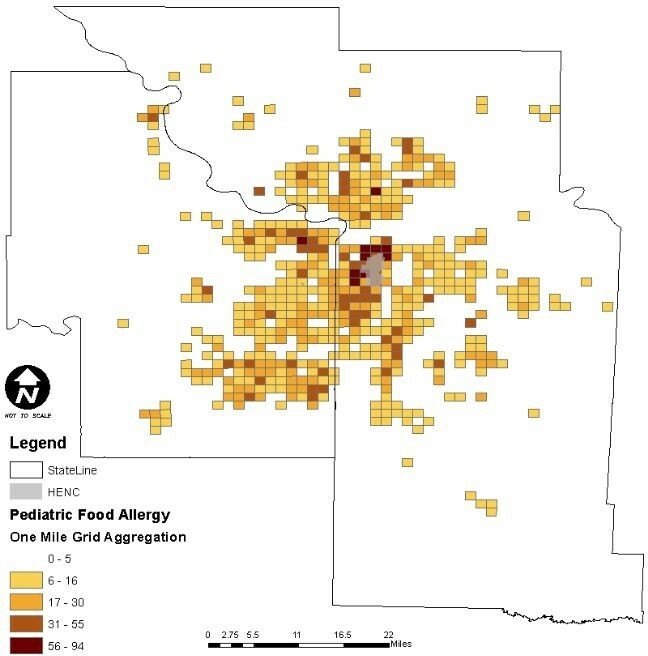 This mal-distribution is beginning to be associated with poor health, such as increased prevalence of childhood food allergies (Humphries, Wilson, Reddyk, Shroba, & Ciaccio, 2015). The production stage of the circuit takes place in America’s breadbasket. Mass production is poisoning water systems, a negative metamorphosis associated with the blood disease, methemoglobinemia (Matson, Parton, Power, & Swift, 1997). This ethos of local food production extends more broadly as evidence mounts that “Well managed farm and ranch lands supply important ecological services including wildlife habitat and groundwater recharge, flood and fire prevention, and carbon sequestration” (Freedgood & Fydenkevez, 2017, p. 4) as well as other positive metamorphic transformations enhancing system metabolism and health. Similar to oncology’s project, social scientists can work to identify driver mutations. “Thirteen mountains” have emerged in the initial charting of cancer’s genetic mutations, and the goal is that “by sequencing the entire genome of several tumor types, every single mutated gene will be identified” (Mukherjee, 2010, p. 450). In the United States, poverty, food insecurity, crime, vacancy, and poor health are all social mutations that can be mapped and identified. Because the specifics of each issue are not going to be identical, neither will the treatment strategy. Space and place matter, and those on the ground need to be provided with the resources and freedom to treat symptoms and cure disease. This requires a transformation in the division of labor. Cooperative labor, social ownership, and community currencies are generating different results in the production process and different modes of assigning value (Blanc, 2011). The SSE is promoting stability in neighborhoods with democracy and group interpretations of value, as members of groups and organizations are brought together to solve common issues. A significant amount of this imaging work is already taking place. For example, the economist Raj Chetty is analyzing, and at the same time dropping the application of neoclassical economics abstract structural models. Instead, he and others are beginning to embrace a more heterodox approach. Without a priori assumptions, big data is allowing patterns to emerge and speak for themselves, promoting the use of quasi-experiments and a break from the rigors of universality in economics. These findings are prompting calls to discover practical solutions and for economists to behave more like engineers (Colander, 2017). A problematic issue found in this new research freedom is the ad hoc nature of the analysis, a classic critique. Additionally, economic systems and the social issues they create are likely to be infinitely more heterogeneous than the cancer genomes and their destructive pathways. Therefore, rather than dropping theory from economics, it is time to draw from the foundational critiques of the structural models that economists are happily abandoning. Marx, Veblen, Polanyi, Durkheim, and Lefebvre supply economists and social science in general with a wealth of understanding and clarity as to the evolution and toxicity of capital. Spatial analysis grounded by questions of metabolism through the circuit of money capital is but one approach to providing a systematic process to research and the development of an interdisciplinary narrative to support alternative social provisioning. Drawing from the threads of history is not admitting defeat, but a necessary step in the progress towards discovery. This sounds like a no, but maybe this is the reality that we must accept as flawed creatures that cannot escape death. Rather than continuing to surrender to the idea that we are fundamentally self-interested individuals, we begin to construct institutions or pathways towards stronger, more complete human behaviors. What draws out the cooperative or altruistic human action and grows solidarity, reciprocity, and mutual aid? Greed, jealousy, hate, prejudice, and racism are both environmentally and individually manipulated. The perceived ubiquity of these evils may suggest that they are a regularity of the human condition. However, this is not the case, as the origins of racism, for example, can be dated to the late 15th century (West, 1982). This suggests that humans are capable of changing the structure of production and reproduction of our daily lives to push these deranged behaviors to the periphery, rather than having them be the core of human activity, as they are under capitalism. This is a daunting task, but are we going to stop fighting cancer just because it is hard? What do we value? This is what needs to be discussed. How do we begin to produce and reproduce life under a value scheme that looks beyond monetary profits? The currently defined imperative for growth needs to be reconfigured. Growth is good, but not as it is constructed by the current power structure under capital. The question becomes, can we reverse and be healed without violent and extraordinary carnage across earth’s corpus? Cancer research suggests two answers to this question. One is that the neoclassical models are correct. The evolution of human nature is axiomatically trending towards the optimal agent. These relentless optimizers will reach their deranged max and kill the earth and all those on it, just as cancer cells are consuming tissue, organs, and human life at an exponential rate. Or second, human nature is pliable, and the fundamental class process can be transformed. Hormonal treatments are effective and can be refined and advanced with continued growth in or understanding of the genome. A second enlightenment is possible. How do humans share without power and hierarchy? This is why value is more than a word. It is a philosophy and a way of life (McMurtry, 2013). The second path is not a solution or cure to cancer, but it is an approach to stem the rising tide of death. The self-interested attribute of human nature is always going to be present, just as the potential for genetic mutation is a fundamental part of human growth and death. Increasingly, we, as both social scientists and oncologists, are coming to realize the importance of interconnections at multiple scales of social and physical aggregation. Environments are fundamental in the development of both humans and all that is occurring within their physiology. Marx described capital as a vampire. For the early stage of the disease, a fictitious metaphor may have been appropriate. However, the advanced stage of capital now requires a more complete narrative. Merging cancer and capital delivers an interdisciplinary context to discuss the economy from metaphorical, methodological, and political levels. 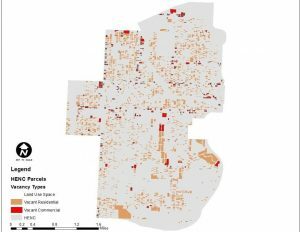 Application of mapping and the spatial examination of economic, environmental, and health outcomes across our communities equips heterodox economists with useful tool for inviting a more general audience to the discussion. Modern oncology has made the leap to a new paradigm. Cell division occurs at the interface of society and science. We can see the end of the homo economicus story on the horizon. Therefore, the time is ripe for heterodox economists to construct new narratives around modern science that advance the human condition and capture the popular imagination, just as methodological individualism and physics established the neoclassical era of economic thinking. Burkett, P. (2014). Marx and nature: A red and green perspective. Chicago, IL: Haymarket Books. Burstein, H. (2000). Cancer at the fin de siecle. Medscape General Medicine, 2(1), 1-4. Blanc, J. (2011). Classifying “CCs”: Community, complementary and local currencies’ types and generations. International Journal of Community Currency Research, 15(D), 4‑10. Chetty, R., Stepner, M., Abraham, S., Lin, S., Scuderi, B., Turner, N., … & Cutler, D. (2016). The association between income and life expectancy in the United States, 2001-2014. JAMA, 315(16), 1750-1766. Colander, D. (2017). Ignorance and economics. Forum for Social Economics, 46(2), 139-144. Dash, A. (2016). An epistemological reflection on social and solidarity economy. Forum for Social Economics, 45(1), 61-87. Diamond, J. (2016, May 19). Donald Trump in 2006: I “sort of hope” real estate market tanks. CNN Politics. Foster, J.B. (2009). The ecological revolution: Making peace with the planet. New York, NY: Monthly Review Press. Freedgood, J., & Fydenkevez, J. (2017). Growing local: A community guide to planning for agriculture and food systems. Growing Food Connections. United States Department of Agriculture NIFA Award No. 2012-68004-19894. Gurbacic, A., & O’Hearn, D. (2016). Living at the edges of capitalism: Adventures in exile and mutual aid. Oakland, CA: University of California Press. Harvey, D. (2012). Rebel cities: From the right to the city to the urban revolution. Brooklyn, NY: Verso Books. Hellman, S. (1994). Natural history of small breast cancers. Journal of Clinical Oncology, 12(10), 2229-2234. Henry, J. (1990). The making of neoclassical economics. New York, NY: Routledge. Humphries, A., Wilson, B., Reddy, M., Shroba, J., & Ciaccio, C. (2015). 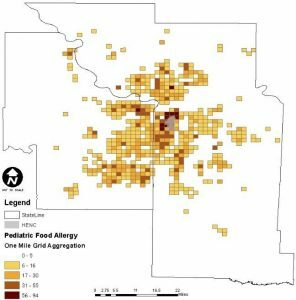 An association between pediatric food allergy and food deserts. Journal of Allergy and Clinical Immunology, 135(2), AB255. Jones, D., Podolsky, S., & Greene, J. (2010). The burden of disease and the changing task of medicine. New England Journal of Medicine, 366(25), 2333-2338. Keynes, J.M. (1991). The general theory of employment, interest, and money. New York, NY: Harcourt. Kropotkin, P. (2014). Mutual aid: A factor in evolution. Middleton, DE: Hampshire. Krumbhaar, E.B., & Krumbhaar, H.D. (1919). The blood and bone marrow in yellow cross gas (mustard gas) poisoning. Journal of Medical Research, 40(3), 497-508. Lefebvre, H., & Nicholson-Smith, D. (1991). The production of space. Malden, MA: Blackwell Publishing. Lucas, R., & Sargent, T. (1981). After Keynesian macroeconomics: Rational expectations and econometric practices. Minneapolis, MN: University of Minnesota Press. Marx, K., Moore, S., Aveling, E., & Engels, F. (2011). Capital, volume one: A critique of political economy. Mineola, NY: Dover Publications. Matson, P.A., Parton, W.J., Power, A.G., & Swift, M.J. (1997). Agricultural intensification and ecosystem properties. Science, 277(5235), 504-509. McMichael, P. (2013). Value-chain agriculture and debt relations: Contradictory outcomes. Third World Quarterly, 34(4), 671-690. McMurtry, J. (2013). The cancer stage of capitalism: From crisis to cure (2nd ed.). London: Pluto Press. Menzel, A. (1875). The Rolling Mill. Retrieved from https://www.wikiart.org/en/adolph-menzel. Mukherjee, S. (2010). The emperor of all maladies: A biography of cancer. New York, NY: Scribner. Neocleous, M. (2003). The political economy of the dead. History of Political Thought, 24(4), 668-684. Palley, T. (2012). From financial crisis to stagnation. New York, NY: Cambridge University Press. Polanyi, K. (2001). The great transformation: The political economic origins of our time. Boston, MA: Beacon Press. Resnick, S., & Wolff, R. (1987). Knowledge and class: A Marxian critique of political economy. Chicago, IL: University of Chicago Press. Sakorafas, G. (2008). The origins of radical mastectomy. AORN Journal, 88(4), 605-608. Stout, L. (2009). Regulate OTC derivatives by deregulating them. Regulation, 32(3), 30-33. Tomasetti, C., & Vogelstein, B. (2017). Stem cell divisions, somatic mutations, cancer etiology, and cancer prevention. Science, 355, 1330-1334. Tcherveva, P. (2015). When the rising tide sinks most boats. Levy Institute Policy Brief No. 15-4, 1-7. United States Census Bureau. (2017). Geography TIGER products. Retrieved from https://www.census.gov/geo/maps-data/data/tiger.html. United States Department of Agriculture’s Agriculture Marketing Service (2013, November27). Food deserts. Retrieved from https://appps.ams.usda.gov/fooddeserts/foodDesert.aspx. United States Geological Survey. (2014, June 2). Environmental health – toxic substances. 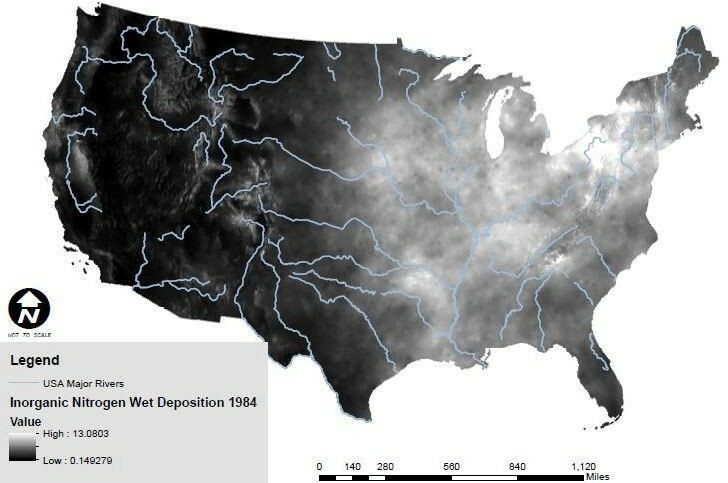 Retrieved from http://toxics.usgs.gov/definitions/eutrophication.html. Veblen. T. (1898). Why is economics not an evolutionary science? The Quarterly Journal of Economics, 12(4), 373-397. Ver Ploeg, M., Breneman, V., Dutko, P., Williams, R., Snyder, S., Dicken, C., & Kaufman, P. (2012). 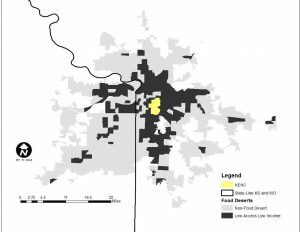 Access to affordable and nutritious food: Updated estimates of distance to supermarkets using 2010 data. ERR-143. U.S. Department of Agriculture. Virchow, R. (1972). Cellular pathology. Ithaca, NY: Cornell University Library Digital Collections. Vogelstein, B., & Kinzler, K. (2004). Cancer genes and the pathways they control. Nature Medicine, 10(8), 789-799. West, C. (1982). A genealogy of modern racism. In Prophesy deliverance! An Afro-American revolutionary Christianity (pp. 47-69). Philadelphia, PA: Westminster Press. Zukan, S. (1995). The cultures of cities. Malden MA: Blackwell Publishers. The fundamental class process is developed in full by Stephen A. Resenick and Richard D. Wolff in their 1987 contribution to Marxian scholarship, Knowledge and Class. Here the FCP is identified as the social relations between appropriators and those that produce the material means of a society. Under slavery, for example, the FCP is between the slave owners (appropriators) and the slaves (producers). Between 1900 and 2010, the number of deaths per 100,000 in the United States climbed from 64 to 185.9 (Jones, Podolsky, & Greene, 2012). For a concise explanation of how cancer spreads in the body see the About Cancer section of the National Cancer Institute’s website, https://www.cancer.gov/about-cancer/understanding/what-is-cancer#differences-cancer-cells-normal-cells. See the Human Genome Project https://www.ncbi.nlm.nih.gov/SCIENCE96/. See the Cancer Genome Atlas https://cancergenome.nih.gov/. Sir Geoffrey Keynes is the younger brother of J.M. Keynes. VAMP is the acronym for a chemotherapy regimen of vincristine, amethopterin, mercaptopurine, and prednisone (Mukherjee 2010).